A talk prepared by Peter Brooke for a programme of events to be held in the Museum of the City of Łodz, 15-17 October 2010 to celebrate the contribution of the Poznanski family to the history of Łodz. The essay has been published in Polish as 'Wiktor Poznanski i wystawa L'Art d'aujourd'hui z 1925 roku' in Jaóbcyk, Kuropatwa;Pik, Pawlak (eds); Imperium rodziny Poznan´skich, Museum Miasta Łodz, Łodz 2012, proceedings of a symposium in the Museum of the City of Łodz, 15-17 October 2010. I must begin with two apologies. First I must apologise for the fact that I am not with you here today. This is due to a problem of health, a chronic fatigue that leaves me feeling I cannot travel. It has been a big disappointment to me to lose this opportunity to visit Poland, a country whose traditions and history have long been of interest to me. And of course, given my own particular interests, I would love to have been able to visit the Modern Art Museum in Łodz. My second apology is that although I am talking about Victor Poznanski, I know so little about him. I know enough to know that I want to know much more. If anyone here has information or is inspired by what I say to pursue the matter further I would be very grateful if they would contact me. It is of course another reason I would like to have been here - I would have learned a great deal more about Victor's family. I should at this point declare the gratitude I feel to Jean-François Delaunay who first began to research Poznanski in Poland and who, in particular, as we shall see. uncovered the very moving story of his death. My own interest in him comes from my longstanding interest in the French Cubist painter, Albert Gleizes. Poznanski worked with Gleizes in the 1920s and it was in this context that, in 1925, he organised the first serious attempt in Paris to show what was happening internationally in the field of non-representational art - the exhibition L'Art d'aujourd'hui. My talk will be centred on this exhibition but first I must say some words about Gleizes, and about the general history of Cubism. Gleizes was, together with Robert Delaunay, Fernand Léger, Henri Le Fauconnier and Jean Metzinger, one of the painters who launched the 'scandal of Cubism' in Paris in 1911 through their paintings shown in the great public 'salons' - the Salon des Indépendants and the Salon d'Automne. Pablo Picasso and Georges Braque, who are usually regarded as the 'inventors' of Cubism, exhibited in a small private gallery and their work was only known to a select clientèle of wealthy connoisseurs. At the risk of oversimplifying we might say that prior to the 1914 war Cubism was divided into two camps - the more public, or 'Salon' Cubists, who included Gleizes, and the more private, or 'gallery' Cubists - Picasso and Braque, later joined by Juan Gris and for a brief period by Léger. There was a degree of rivalry between them and a clear difference in intentions. While Picasso and Braque painted on a small scale using an intimate, domestic subject matter, the Salon Cubists tended towards very large paintings with an ambitious subject matter. The first academic specialist in the work of Albert Gleizes, the American Daniel Robbins, called it 'Epic Cubism'. This is an outstanding example, Gleizes's 1912 painting, Harvest Threshing. The lives of the painters were of course severely disrupted by the war. 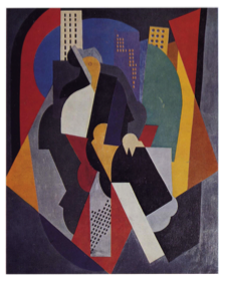 Gleizes, together with the 'Dada' painters Marcel Duchamp and Francis Picabia, spent most of the war in New York; Robert and Sonia Delaunay went to Spain; Braque, Léger and Jean Metzinger served in the army (as did Gleizes more briefly). Picasso stayed in Paris together with a group of painters who were largely not French and therefore not subject to conscription - the Spanish Juan Gris, the Italian Gino Severini, the Mexican Diego Rivera. 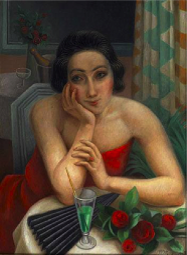 Cubism was largely kept alive as a school of painting at this time by the great gallery owner, Léonce Rosenberg, who bought the works of painters such as Gris and Metzinger and Severini, building up a collection which he showed in a series of exhibitions once the war was over. 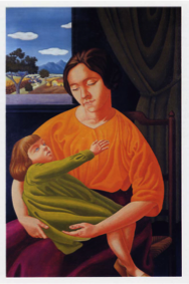 However, although Rosenberg had shown that Cubism was still alive as a school of painting and still capable of development, he also encouraged the painters who were dependent on him to return to a much more representational, 'classical' style of painting. This is a painting from 1923 by the former Cubist painter, Jean Metzinger. Cubism, it was said, had reintroduced ideas of form and structure into painting at a time when it had been lost in the beautiful shifting coloured mists of Impressionism. But Cubism, in reaction to the sensual self-indulgence of Impressionism, had been violent, barbaric. Now, in reaction to the violence and barbarism of the war, the time had come for a return to a more conventional and graceful representational style. Jean Cocteau called for a 'return to order'. Gino Severini, who did this painting in 1920, wrote a manifesto called From Cubism to Classicism. Picasso, supported by Léonce's much more commercially minded brother, Paul Rosenberg, held an exhibition of paintings done supposedly after the manner of the early nineteenth century French painter Ingres. 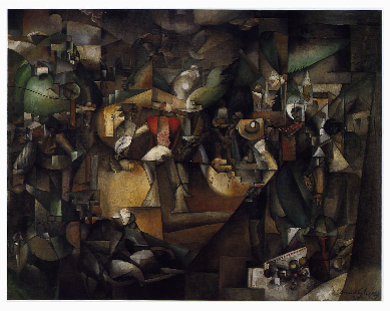 This was the situation that was developing in Paris when Gleizes returned from the United States in 1919. He was very impressed by the achievement of the Cubist painters during the war, most especially by Juan Gris and Jean Metzinger. Because the earliest Cubism had wanted to emphasise form in opposition to the Impressionist and Fauve emphasis on colour, the painters had thought of their structures as sculptural or three dimensional, hence the apparent interest in 'cubes'. This is an example from Fernand Léger in 1909-10. But Juan Gris and Jean Metzinger had developed a painting that was much more respectful of the actual flat, two dimensional nature of the canvas the reality of the surface that was to be covered in paint. Juan Gris's portrait of his wife, Josette, 1916. Their paintings were constructed on the basis of the interaction of differently shaped and coloured planes superimposed on each other. 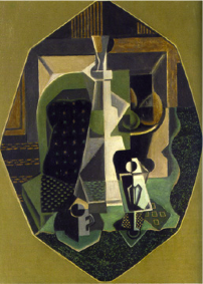 Often it looked as though these paintings had been worked out as pure abstract arrangements of shapes with the figurative element - often, like the earlier work of Picasso and Braque, an intimate domestic 'still life' subject matter - only added at the end of the process. 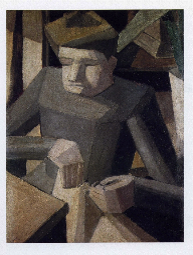 They had come to the edges of a non-representational painting as can be seen in this example - a still life from 1918 by Jean Metzinger. 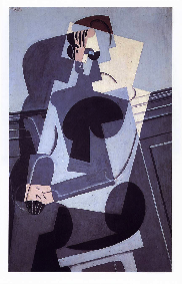 Gleizes saw that this art was full of possibilities for the future. In the first instance he applied these methods to his own much more ambitious subject matter - for example the urban landscape which had impressed him so deeply in New York. (On the avenue', 1920). But he was soon producing work which was entirely non-representational, like this 'Composition' from 1921. Although several schools of non-representational painting had emerged, notably in the Soviet Union, this was an unusual development in Paris, especially at this precise moment when the fashion was the return to classicism. 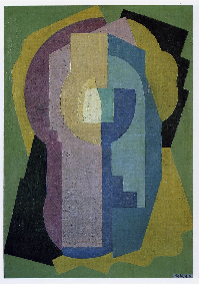 Gleizes explained his intentions in a small book published in 1920 - Du Cubisme et les moyens de le comprendre - in which he explained that Cubism was now developing solid principles which could be taught and which could be as fruitful for the future development of painting as the mathematically based principles of three dimensional perspective had been at the time of the Renaissance.